My fiancé Joe and I planted a mushroom garden last year, which is to say, we drilled hundreds of holes in logs, hammered spore plugs in the holes, and waited. I can’t speak for Joe, but I visited the logs every morning, excited for them to sprout. Sometimes I daydreamed about pastas and salads. But after four months, when it should have been producing mushrooms for weeks, our garden was a barren, woody wastelands, and we gave up (queue Charlie Brown theme song). Lots of people grow mushrooms. All are better at it than I am. But fungus farming is one of those skills for which evolution trumps brainpower. Through millions of years living with fungi, insects became master fungus gardeners. The most famous fungus-farming insects are leafcutter ants. They carry leaves like sails to underground chambers where they grow a fungus that serves as their main and, in some species, only food. Scientists say 2 groups of insects besides ants farm fungi: beetles and termites, both of which are fascinating and have unique methods for carrying their fungi around and keeping them alive. However, like most people, scientists have a tendency to ignore tiny and less charismatic animals, which might be the reason why a fourth fungus farming group, scale insects, lives above our heads every day without being noticed by you, me, or your local bug expert. In fact, we know almost nothing about fungus-farming scale insects, despite the fact that they kill trees and could become tree-killing machines as the climate warms. I’d guess you probably never heard of scale insects—I hadn’t before I started graduate school—and, yet, they are all around us sucking on and, in some cases, killing plants we care about like shrubs and street trees. They do so without moving much. Scale insects are the sloths of the insect world. Some crawl away from their mothers when they are born, settle on a plant, and never move again. Some move a little throughout their lives, mostly when poked by ants, but that’s a different story. Though natural selection, scale insects have found clever ways to survive without moving: one of these ways is building a fungus umbrella. Some scale insect species live in tiny chambers under a fungus called Septobasidium (Photo 1). Over 175 of these species have been discovered all over the world (Henk 2005), and like many groups of organisms, Septobasidia are most diverse in the tropics. Each Septobasidium fungus grows in a mat above 1 to over 100 scale insects. The fungus infects some of these scale insects with hyphae, but only enough to get what it needs to survive and grow. See header photo above: Septobasidium fungus collected from an urban oak tree (Quercus phellos) in November 2013 (Raleigh, NC, USA). Zoom in on the header photo above, peel back the fungus, and this is what you find: a scale insect. Photo credit: Andrew Ernst. Each infected scale insect becomes filled with hyphae that look like, and here I quote Dr. John N. Couch from the University of North Carolina (1896-1986), the man who studied scale insects and their fungi for nearly his entire adult life: “a miniature string of sausages.” The fungus’ sausage-y hyphae draw nutrients from the scale insects, and the fungus stores these nutrients in oil globules in a mat above the scale insects. In return for feeding the Septobasidium fungus, scale insects get protection from parasitoids that can mummify and kill them. John Couch tried putting the scale insects out on branches alone, and they all died. They need the fungus for protection. During his career, Dr. Couch answered some of the questions I had when first learning about the scale insect fungus gardens. For example, how do the scale insects become infected with the fungus? In the spring, the scale insects are born as what entomologists call “crawlers”, the only life stage during which scale insects look like insects at all. The fungus emits chemicals that smell good to the crawlers, so that they will crawl away from their mothers and onto its surface to the fungus’ spores. Adult female scale insect with crawlers (right) walking toward and onto the fungal surface. Reproduced from: Couch, JN. 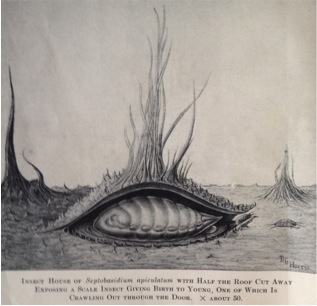 (1938) The genus Septobasidium. University of North Carolina Press, Chapel Hill. Some of the crawlers, now carrying Septobasidium spores, scoot back under their parent fungus, while others venture off, hitching rides on birds’ feet to new trees. The departing crawlers start new fungus gardens. Within a few hours, all of the crawlers are anchored to trees with their straw-like mouthparts and will never move again. From there, the fungus does all the moving and most of the growing. 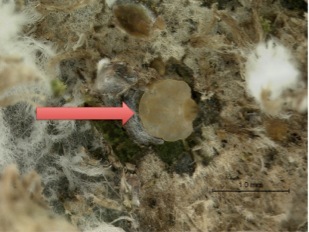 Most Septobasidia fungi do not tap into plants directly; they rely on the scale insects to connect them to plant nutrients. And together, the scales and the fungi can take down entire trees. Scientists think they may attack dead or dying trees in ways similar to that of the Ambrosia beetle and their associated fungi, but that’s just a hunch. No one knows. One ominous possibility is that climate warming could turn scale insect fungus gardens into more destructive versions of themselves. Scale insects tend to become more abundant where it is warmer. If the scale insects benefit from warming, so, too, could the fungus, and the fungus gardens could kill trees more often. But we know so little about these gardens that we can’t predict their responses to climate warming. Because we rely on trees keep us healthy, the scale insect fungus gardens could be causing a lot of harm, harm that could escalate as the climate warms, though we won’t know unless we start studying them now. We have a lot to learn about fungus farming insects, and, since we’ve only discovered an estimated 3-10% of all insects, odds are that some fungus farmers are still awaiting discovery. In the end, we know some of the most sophisticated fungus farmers like ants and beetles are taking advantage of human changes, and we suspect some of the simpler ones like scale insects might be, too. But even this simple characterization of some relative to others is a bit of a misstep since, as is clear each night at my dinner table, every fungus-farming insect is more sophisticated than Joe and me. 1. Gaston KJ. (1991) The magnitude of global insect species richness. Conserv Biol 5: 283-296. 10.1111/j.1523-1739.1991.tb00140.x. 2. Gaston KJ, Hudson E. (1994) Regional patterns of diversity and estimates of global insect species richness. Biodivers Conserv 3: 493-500. 10.1007/BF00115155. 3. Gering JC, DeRennaux KA, Crist TO. (2007) Scale dependence of effective specialization: Its analysis and implications for estimates of global insect species richness. Divers Distrib 13: 115-125. 10.1111/j.1366-9516.2006.00301.x. 4. Henk DA. (2005) New species of septobasidium from southern costa rica and the southeastern united states. Mycologia 97: 908-913. 10.3852/mycologia.97.4.908. 5. Montoya-Lerma J, Giraldo-Echeverri C, Armbrecht I, Farji-Brener A, Calle Z. (2012) Leaf-cutting ants revisited: Towards rational management and control. Int J Pest Manage 58: 225. 6. Couch, JN. 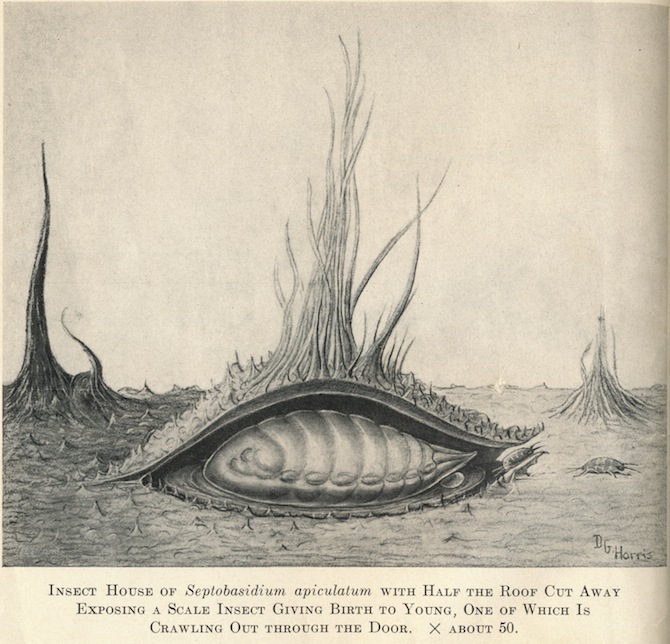 (1938) The genus Septobasidium. University of North Carolina Press, Chapel Hill. Emily Meineke is a PhD student in Entomology at NC State. 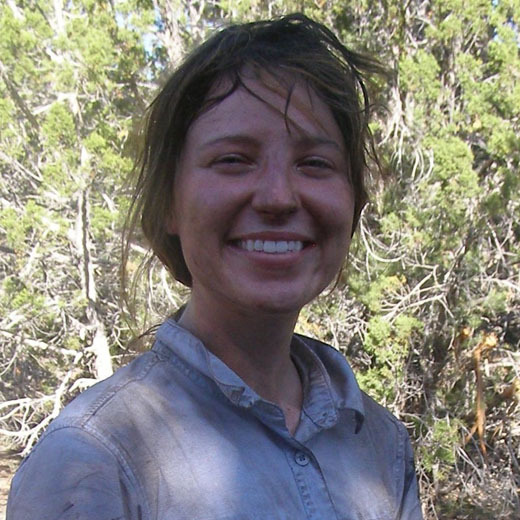 She’s interested in how human pressures (like urbanization) change the insects that live around us, particularly herbivores that endanger trees. Follow her on Twitter: @EmilyMeineke.